A Nigerian caretaker at one of London’s top public schools has launched a desperate appeal to the Home Office to allow his brother to visit the UK from Nigeria for a life-saving bone-marrow transplant. 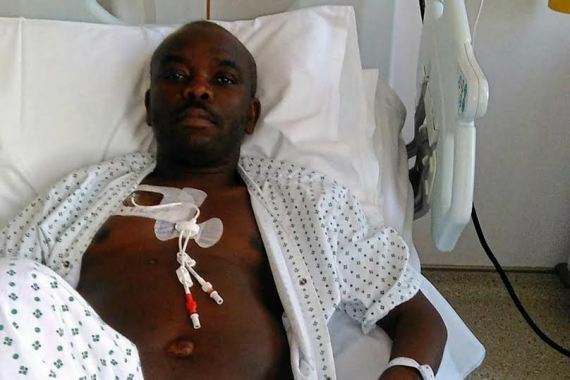 Isaac Aganozor, who works at Dulwich College, was diagnosed with leukaemia in August and needs an urgent stem cell transplant from his brother Patrick, who lives with his family in Nigeria. Patrick, a tricycle courier who earns £2.30 a day, was refused a visa to enter the UK as he did not meet economic requirements. This was despite the £36,000-a-year school offering to sponsor his month-long “mercy mission” and pay £1,500 for his return flight. His brother Isaac, 44, who lives in Sydenham Hill, is being given regular high-dose chemotherapy sessions at St Bartholomew’s hospital but has been told that “time is running out”. A search of the national donor database revealed that Patrick, 38, is a 50 per cent match for his brother, and the only realistic hope of his receiving the stem cells in time. Despite a letter from hospital specialists detailing Patrick’s status as the “only available matching donor for the urgent stem cell transplant”, he was refused a visa in April. "You have stated your brother has acute myeloid leukaemia and you are to be a stem cell donor. I must take into account your personal socio-economic circumstances in Nigeria when reaching my decision. I note that you are a tricycle driver earning £69 a month in Nigeria but you state you have £1,500 for this trip. Given your limited economic circumstances in Nigeria I am not satisfied that these provide you with an incentive to leave the UK at the end of your stay as claimed.” Mr Aganozor, who has been off sick from work since December, said there is no danger that his brother will try to stay in the UK after the transplant as he has to care for his four-year-old daughter and ailing mother in Lagos. He said: "I was so happy when I found out that my brother was a match. But when his application was rejected it was a bigger shock than getting told I had leukaemia in the first place. The immigration officers didn’t consider my health, only economics. It is incredibly frustrating to know that the solution that could save my life is only six hours away by plane. I feel the sickness inside me, I don’t know what to do. My life is gradually slipping away." "Isaac is a quietly spoken, hard-working man who gets on with his job incredibly well. I’m appalled by the Home Office’s decision. It is essentially because Patrick is a poor man that he can’t come across to do the only thing he wants to do — save his brother’s life. I understand the concerns around immigration and people who want to take advantage of our system, but Patrick wants to go back to his family in Nigeria straight after the operation. Nigeria was part of the Commonwealth yet we don’t allow an individual in on humanitarian grounds for a mercy mission — it is disgusting." Helen Hayes, the Labour MP for Dulwich and West Norwood, has held discussions with immigration minister James Brokenshire. But she was told a priority appeal for a new visa is necessary, which will require the involvement of specialist immigration lawyers. "I’m appalled that the Home Office is showing so little flexibility and compassion. I am doing everything possible to press the Home Office to consider the new application as a matter of urgency, so that Patrick can travel before Isaac’s health deteriorates further." The Home Office confirmed: "All cases are carefully considered on their individual merits and the onus is on the individual to provide the necessary supporting evidence to meet the UK immigration rules. We are sensitive to cases with compassionate circumstances but all visa applications must be assessed against the immigration rules. The applicant is free to submit a new application with supporting evidence."